A new study seems to confirm my worry about the strength based approach that it may evoke a fixed mindset and undermine performance and development. Abstract: Students who believe that their intelligence is able to grow over time (malleable/ growth mindset) perform better on measures of academic success than students who believe that intelligence is a fixed trait that cannot be changed (fixed mindset; Dweck, 2000). Previous research on the effectiveness of mindset interventions have demonstrated a causal connection between a malleable mindset and increases in end of term cumulative grade point average (Aronson, Fried, & Good, 2002) and performance on standardized math exams (Blackwell, Trzesniewski, & Dweck, 2007). The present study tested the effectiveness of a malleable mindset intervention in an applied higher education setting. Furthermore, the intervention itself was designed to be sustainable, low cost, and easy to implement in a large-lecture college course. 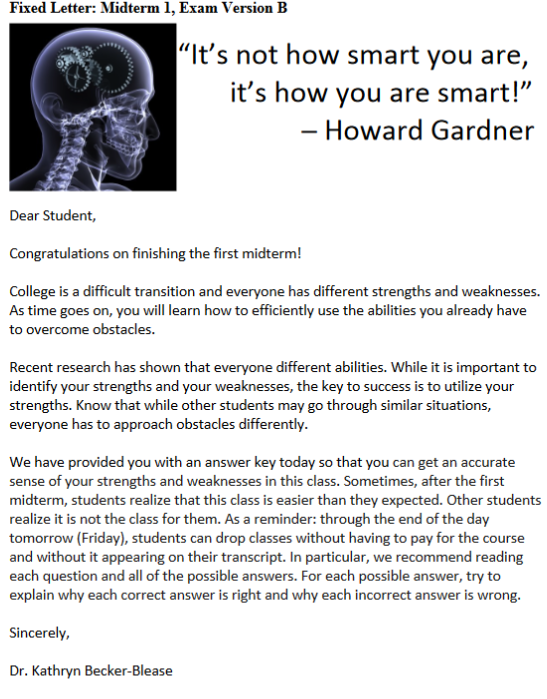 Students enrolled in an introductory psychology course (n=278) were randomly assigned to receive one of three letters after the completion of their first midterm exam. 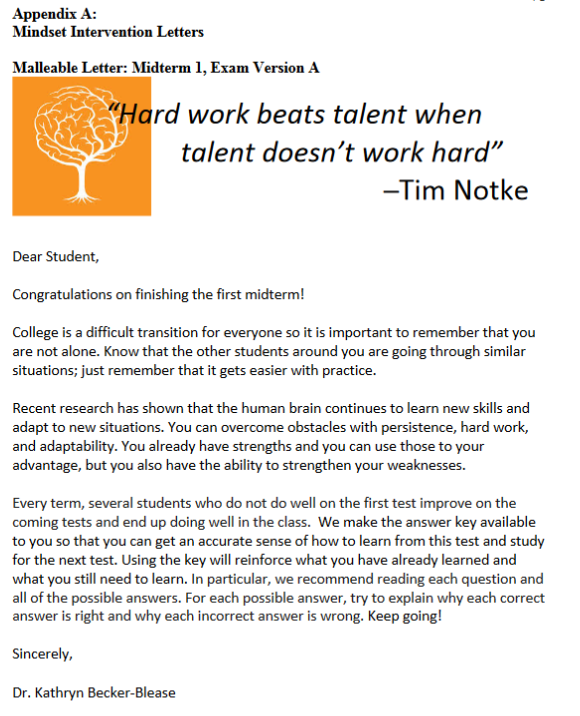 The messages in the letters were centered on either promoting a malleable mindset, a fixed mindset, or thanking students for their class attendance and participation. Additionally, a manipulation check was administered nine weeks post- intervention to see if students read their letter and remembered its take-home message. At the end of the term, between-group differences on measures of post-intervention academic success were assessed.